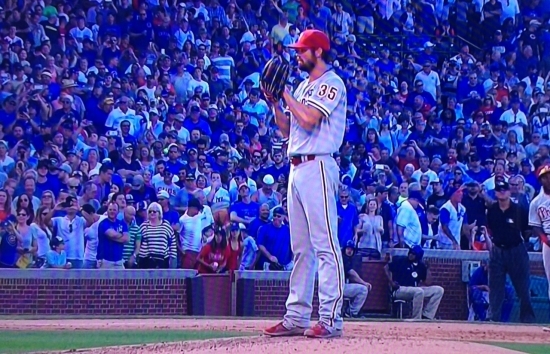 Philadelphia Phillies ace RHP Cole Hamels threw a no-hitter Saturday afternoon against the Chicago Cubs at Wrigley Field. The Phillies won 5-0. Cole threw 129 pitches with 13 K's and 2 BB's. This was the 13th no-hitter in Phillies' history and Hamels' first solo effort. He was part of a combined no-hitter on September 1st, 2014 vs. the Atlanta Braves along with Jake Diekman, Ken Giles and closer Jonathan Papelbon. It was the first solo no-no thrown by a Phillie since Roy Halladay vs. the Cincinnati Reds in the NLDS on October 6, 2010. C Carlos Ruiz has now tied the MLB record for no-hitters caught at 4. The Chicago Cubs have not been no hit in 50 years. The last time came when Sandy Koufax threw a perfect game on September 9th, 1965. The last time a no-hitter happened at Wrigley field was 43 years ago on September 2nd, 1972 vs. the San Diego Padres with Milt Pappas on the mound. With the trade deadline fast approaching on Friday, this could be Hamel's last mound appearance in a Phillies uniform. Quite a way to leave an impression.